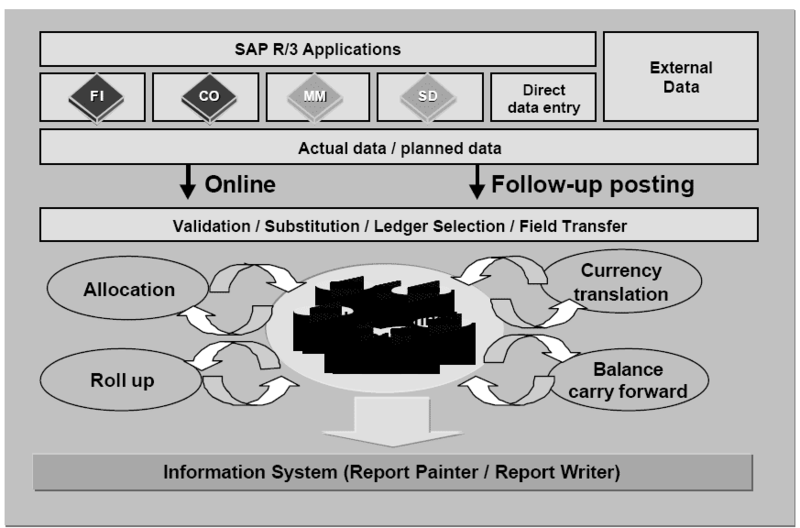 Cross-application reporting is not as diverse as SAP BW reporting.The OLTP System is optimized for transaction processing, and a high reporting load would impact the overall performance of the system.The solution is FI-SL reporting in SAP BW. 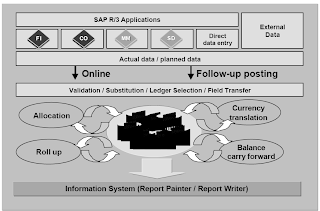 level of detail.Selective data retrieval: The assignment of transactions to particular combinations of company code/ledger or company/ledger, determines which ledgers are updated using the data. Adjustment postings are possible in the FI-SL system (for example, when valuing currencies). You can post data in various versions.In FI-SL, you are able to use alternative charts of accounts (operative, group-specific, and country-specific charts of accounts). Using various fiscal year variants, enables you to create weekly or monthly reports, for example.Validations or substitutions allow you to check or modify specifically the validity of the data, at the point when it is entered into the FI-SL system. In addition to data from FI, CO, MM, and SD, external data, and data that is entered directly into the system, can also be posted into FI-SL.The update takes place either online or as subsequent processing. With subsequent processing, a predefined number of data records are transferred to the FI-SL database tables, at a certain point in time, independently of the time the original document was created. the validation can check the data that is going to be updated, according to a set of freely definable rules  the substitution can replace the data with changed data, according to particular rules, before the update takes place. The function Currency translation translates amounts that have been posted to the ledger in the FISL system.At the fiscal year change, use the Balance carry forward function to transfer actual and plan values from the previous fiscal year into the new fiscal year. Allocation (assessment/distribution) means the transfer of an amount that has already been posted, from a sender object to one or more receiver objects.  To get faster reporting processing times, create a roll up ledger containing totaled and summarized data from one or more ledgers. 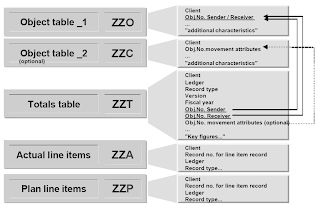 When you create an FI-SL table group, up to 5 tables with fixed naming conventions are created (after the organizational unit is determined for unit or company): Totals table (...T), actual line items tables (...A), plan line item tables (...P), object table_1 (object/partner) (...O), and the optional object table_2 (movement attribute) (...C). To evaluate these tables via reporting, ledgers are defined that refer to this kind of table group (with the total table in the middle).The totals table contains fixed key fields, such as, client, ledger, record type, version, fiscal year, object number, sender (credited account assignment element), object number receiver (credited account assignment element), company code, account number, business area, cost center, function area for the credited account assignment element and company code, account number, business area, function area for the debited account assignment element and additional characteristics. The object number sender indicates a credited account assignment element (for example, cost center, profit center, or project) with additional properties (additional characteristics) that are contained in the object table_1.In the same way, the object number receiver indicates a debited account assignment element (for example, cost center, order, profit center, or project) with additional properties (additional characteristics) that are contained in the object table_1. A particular feature of data modeling in the totals table, is the period block: There is a key field RPMAX (period) that specifies the current meaning of the period for key figures TSL16, HSL16,and KSL16. The meaning or the periods for key figures *SL01 to *SL15 is then output. This means, when RPMAX has the value "016", the values for key figures TSL16, HSL16 and KSL16 refer to period "016" of the fiscal year variant set in Customizing. If the RPMAX has the value "064", the values for key figures TSL16, HSL16 and KSL16 refer to the period "064", the values for key figures TSL15, HSL15 and KSL15 to period "063", ... of the fiscal year variant set in Customizing.You can display the fiscal year variants with a period number > 16 and the key figure values are divided among various data records with different RPMAX values. 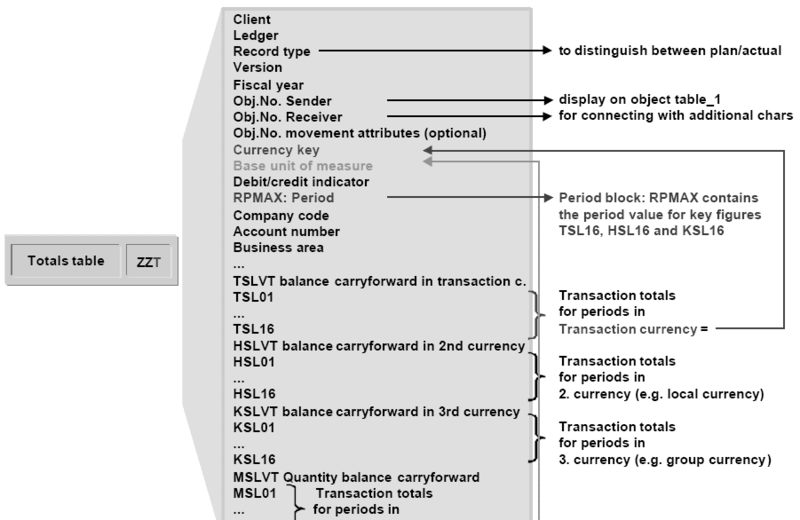 Currency handling is explained here: The key figures TSL01 to TSL16 always have the transaction currency, which is specified in the field RTCUR (currency key). The key figures HSL01 to HSL16 have the so-called second currency: this is specified in Customizing and can be, for example, the house currency. The key figures KSL01 to KSL16 have the so-called third currency: this is specified in Customizing and can be, for example, the company code currency. A ledger is a closed reporting area, which always refers to exactly one totals table. You can think of a ledger as a logical part of a totals table.Several ledgers can be defined for a totals table. A ledger is created in Customizing in a totals table. 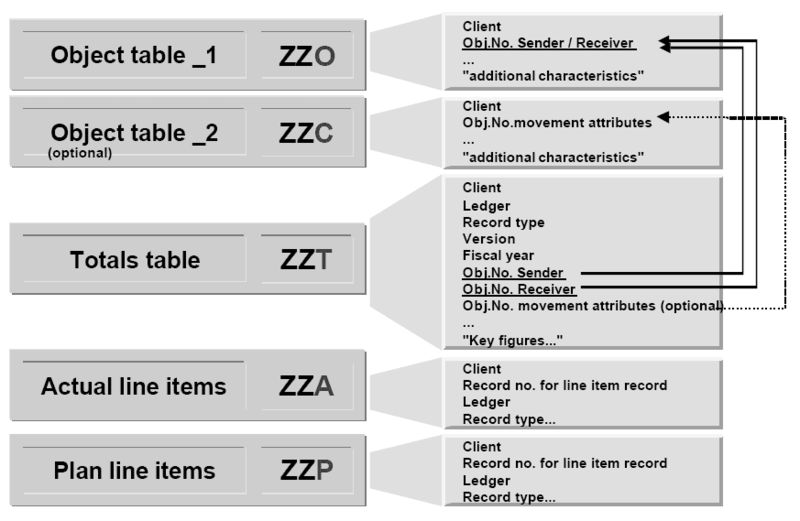 The ledger contains Metadata, such as the set of rules by which it is updated.A maximum of 4 different sender structures (MOVE or programable Exit) can update a ledger. Manual correction postings are also possible. n But the transaction data itself remains in the tables of the table group. 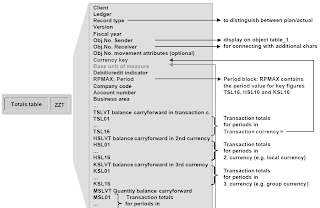 The FI-SL transaction data is stored in a group of tables. A ledger can refer to part of a table group. The object numbers in the totals table are not 'expressive'. The period block means that a key figure TSL01 can refer to two different totals records in two different periods. The currency information is only partially stored in the table group. When you generate an FI-SL Data Source, a ledger, which is based on a totals table, proposes a combination of characteristics and key figures.